In a medium bowl, cream together the butter and sugar. Beat for 15 minutes using an electric mixer. Stir in the flour and baking soda, then fold in the pecans. Drop by rounded spoonfuls onto the cookie sheet. Bake for 20 to 22 minutes in the preheated oven, or until lightly browned. Allow cookies to cool on baking sheet for 5 minutes before removing to a wire rack to cool completely. A major step has been omitted - rolling/shaking the completed cookies in powdered sugar while they are still hot. I added a couple of teaspoons of coconut and they were even better! 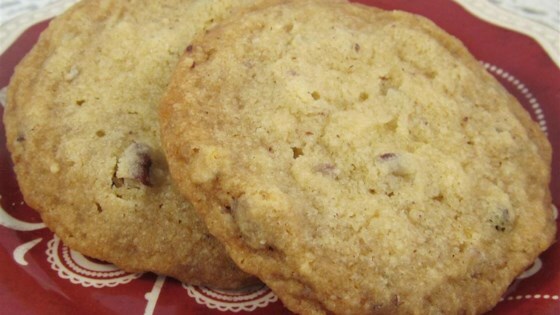 These cookies need 1 tsp vanilla extract to bring out the full flavor of the pecans. These are absolutely amazing. I won't even try another recipe! I didn't get the full 5 dozen out of them, but they are so easy to make, doing another batch is just fine! These had a wonderful buttery flavor. I used salted butter and toasted the finely chopped pecans for extra flavor. They had a nice crisp texture which we prefer.